Associate Member of the American Association for Cancer Research (AACR) and member of the Fundraising Committee of the AACR’s Associate Member Council. 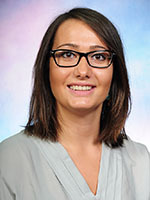 Holowatyj recently defended her PhD at the Wayne State University School of Medicine and Barbara Ann Karmanos Cancer Institute in Detroit, Michigan, in the Department of Oncology, and earned her Graduate Certificate in Public Health Practice degree from the Department of Family Medicine and Public Health Sciences. She is also a part-time instructor in the Department of Biological Sciences. Her research focuses on examining molecular factors that impact cancer diagnosis and prognosis in medically underserved populations. Cancer is a disease that knows no boundaries. It knows not of: the words grandpa or daughter, nor of career aspirations, nor of political affiliations or Congressional districts. Without any boundaries, cancer ravages healthy tissues in the human body. For me, cancer knew not of the word grandpa. Beginning at the age of 9, I witnessed my grandpa tirelessly fight non-Hodgkin lymphoma (NHL). No longer was he pushing me on my tree house swing outside or teaching me how to sneak ice cream from the freezer when my grandma was preoccupied. The bleak, white walls of the hospital became too familiar as I sat with him, reading books together during his inpatient admissions. Yet, even while suffering from side effects of treatments, he always managed a smile for me. He gave me a face and personal connection to cancer before he lost his battle to NHL five years later. But I am always left thinking, what if? What if we had found today’s cures yesterday? What if we had discovered that new drug sooner? What if that treatment was available to more patients? Could the lives of grandparents, parents, aunts and uncles, daughters and sons, nieces and nephews, have been saved? While that answer will forever remain unknown, there is a clear solution right now. Provision of robust, sustained, and predictable research funding for the National Institutes of Health (NIH) fuels cancer prevention, detection, and treatment research to save lives. Thus, advocacy and action efforts to urge Congress to support a $2 billion increase for the NIH this spring are vital. My grandpa was a cancer warrior, a champion, and of course, a hero who has made my pursuit of a career in oncology both a passion and a privilege. However, passion is not enough to fuel the career aspirations of each individual whose life has been touched by the disease. As an early-career researcher, funding from the NIH has supported my career training, led to my own cancer discoveries, and has afforded me time to volunteer at local Detroit public schools and encourage fourth-grade students to pursue careers in science. 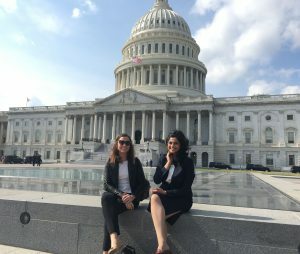 Holowatyj is joined outside the U.S. Capitol by fellow Early-career Hill Day representative Asra Shaik. I tell the students how we fight cancer from scientific laboratory benches and microscopes all the way to health care clinics and patient bedsides. This work of mine, and the work of my fellow early-career cancer researchers, depends on sustaining the recent momentum that has included the creation of the National Cancer Moonshot and the passage of the 21st Century Cures Act. These initiatives not only support groundbreaking scientific research; they also fuel economic growth across all Congressional districts, and maintain the United States’ position as the global leader in medical research. As a disease that knows no boundaries, political or otherwise, cancer has also brought a large nucleus of people together, including bipartisan Congress members on Capitol Hill. This year, I had the privilege to be selected for the second time to participate in the AACR Early-career Hill Day. My group held five meetings with legislative staff from the offices of U.S. Senators Ted Cruz (R-Texas), John Cornyn (R-Texas), and Debbie Stabenow (D-Michigan); as well as U.S. Representatives Debbie Dingell (D-Michigan) and John Moolenaar (R-Michigan). Sharing the importance of medical research funding in supporting economic growth and jobs across the United States. 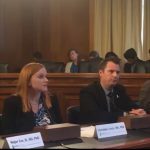 Amidst the fast-paced atmosphere and fluid agenda on the Hill, this event bridged early-career cancer researchers with Congressional offices to personalize the impact of NIH funding on our individual careers and communities. And I got to share that special story of my grandfather, underscoring that cancer is personal. Cancer does not know the word grandpa, but a devastating loss to this disease has inspired my career and led me to advocate for science policy. Cancer knows no political boundaries, but the importance of medical research has spurred bipartisan support from Congress for robust and sustained increases in NIH funding. The boundaries that cancer does not know have led to significant actions on both personal and national levels. There’s a momentum right now for Americans to get involved and share their own stories. Together, these actions have no boundaries and can become a cumulative effort to find cures for cancer and change the world. 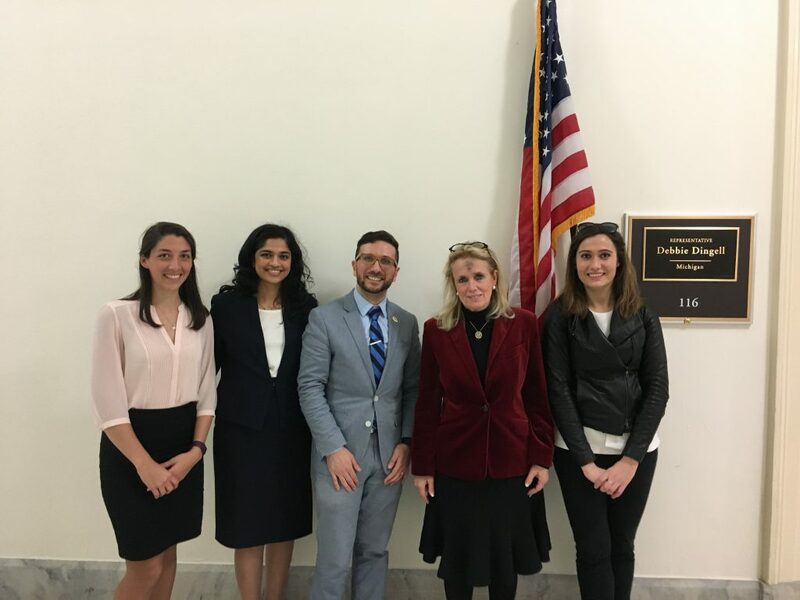 From left: Early-career Hill Day representatives Adrianne Spencer and Asra Shaik; Nicholas Bashour, the AACR’s manager of science policy communications; U.S. Rep. Debbie Dingell (D-Michigan); and Andreana Holowatyj. Dingell met with the researchers on March 1, Ash Wednesday.